Mr. President & The First Lady Are Egg-Specting Two Eaglets! 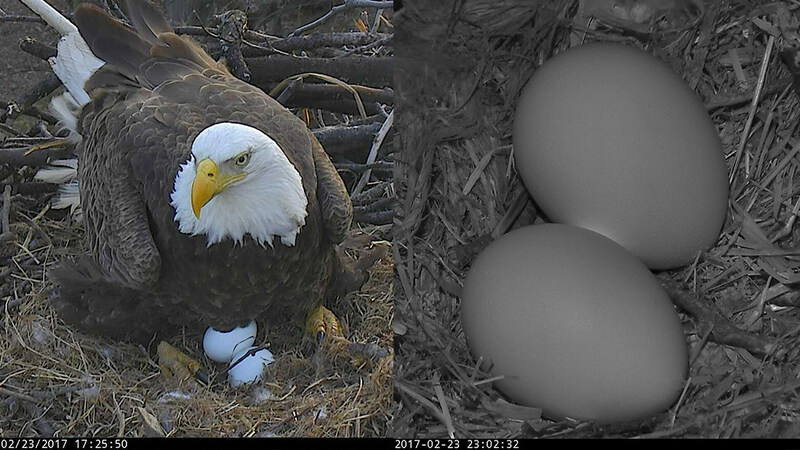 World-famous Bald Eagle parents have welcomed their second egg of 2017 into their Washington DC nest. World-Famous Bald Eagle parents, Mr. President & The First Lady, have welcomed their second egg of 2017 into their Washington DC nest. On February 19, The First Lady laid her first egg of 2017 LIVE on the DC Eagle Cam (dceaglecam.org). The world has been watching and waiting to see if she and her faithful eagle companion, Mr. President, would have the chance to raise two eaglets again in 2017, and now that opportunity has arrived. From this point forward, both parents will take turns diligently and vigilantly incubating and protecting their future-eaglets. Be it rain, hail, snow, thunder, lightning, predators, or even hurricanes, eagle parents are very protective and will weather all types of situations to keep their eggs safe and warm. The approximate 35-day incubation countdown to hatching has now begun, which means the American Eagle Foundation (AEF), its DC Eagle Cam Project partners, and viewers will be on "hatch-watch" the last week of March. In 2015, these eagle parents raised one eaglet (deemed DC1) in their nest at the top of this Tulip Poplar Tree in the U.S. National Arboretum. In 2016, they raised two eaglets (which were deemed DC2 & DC3 before the public officially nicknamed them Freedom & Liberty). "If all goes well, we will be inviting DC4 & DC5 into the world in about 5 weeks! The fact that we only have two years of previous nesting data on these birds, however, still begs to question whether it's possible that The First Lady could lay a third egg this week, especially since their nest is slightly larger this year," says AEF representative Julia Cecere. "All we can do now is watch and wait. We are more than ecstatic about these two eggs...but watching three eaglets raised in one nest would be such a thrill for viewers everywhere." For all of the DC Eagle Cam fans who have fallen in love with watching this eagle pair, there is now a beautiful hardcover book documenting the pairs' first two nesting seasons in the National Arboretum. The book can be purchased on www.eagles.org or by visiting www.dceaglecam.org. "Eagles have been the proud and majestic symbol of freedom for the USA for 235 years," says AEF Founder and President Al Cecere. "During our second season online, we hope this American Eagle family reality show will again captivate, inspire, and educate many millions of animal and nature lovers, as well as die-hard patriots and Bald Eagle fans. This is certainly a wonderful experience that all Americans can rally around, embrace and feel united about."